Detailed information about Phase 3 of the Eads Street construction work will be provided as we approach the Fall. Visit www.395expresslanes.com/pentagon for more information. If you have any questions, please contact the WHS TMPO at whs.pentagon.em.mbx.dod-shuttle-bus@mail.mil. 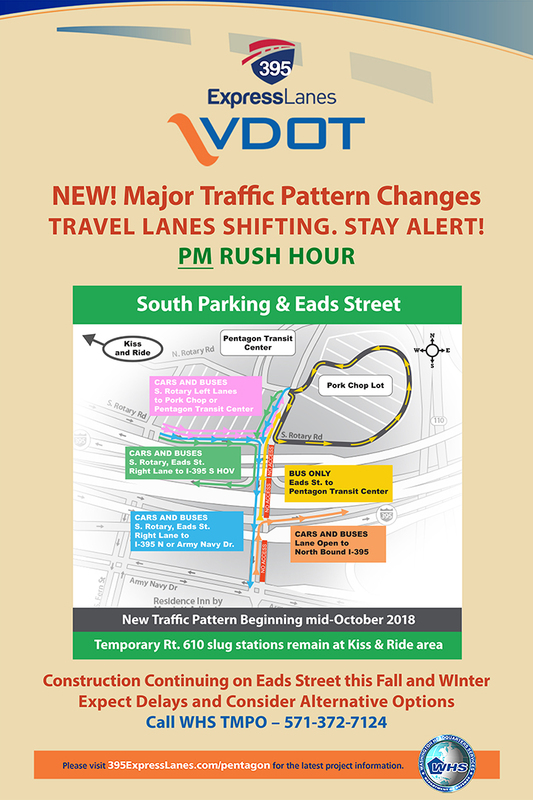 ·In the event of significant congestion during the PM rush hour, drivers should be prepared to take alternate routes to I-395 South HOV lanes. See https://www.395expresslanes.com/pentagon for more details. Additionally, the following is our transportation advisory for the upcoming traffic pattern change. Please also note that the 395 Express Lanes website has a new look and a new URL at https://www.expresslanes.com/projects/395. If you have any questions on the 395 Express Lanes website, I have included Brent McKenzie on the cc line to this email. The temporary relocation of Route 610 Stafford and Mine Road slug stations will remain at the Kiss and Ride area on N. Rotary Road during the Eads Street construction. 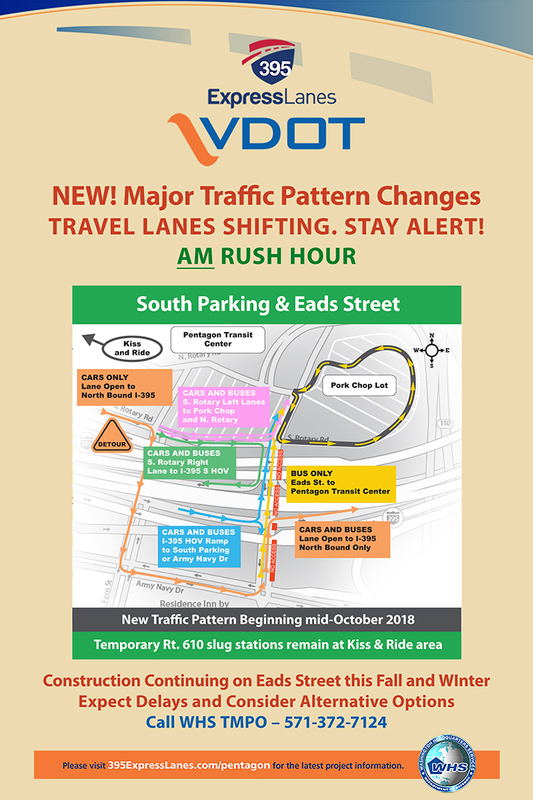 Please pay close attention to traffic control direction, signage and traffic signals as they will change to align with the new traffic patterns. Visit https://www.expresslanes.com/projects/395 for more information.